I made the mistake this week of trying 2 similar dip recipes at the same time, side by side. Of course I got into a hurry and dumped the wrong ingredients into the wrong bowl. The result was pretty tasty. Below are the 2 separate recipes. Our family has always enjoyed the first with the peanuts but when you combine both recipes with the peanuts and the toffee bits, it's even sweeter and a great treat to share! 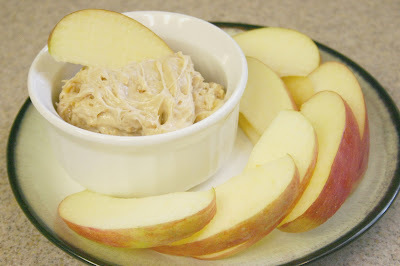 Blend ingredients and serve with apple slices.